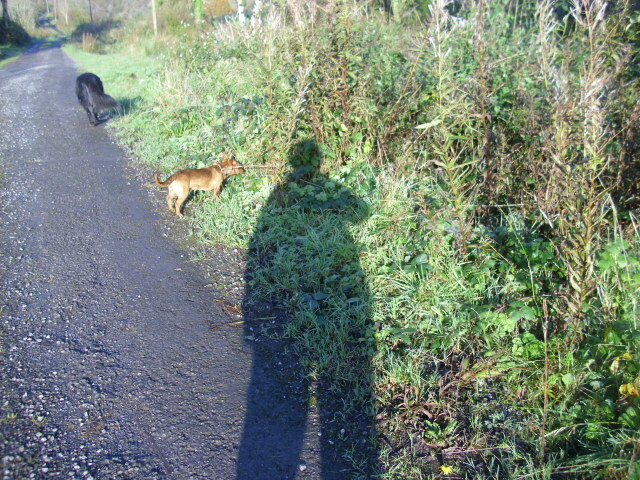 The weather has been fab here this week. Lovely and sunny with a high of 24 c on Tuesday. Very unusual for an Irish March. Today has been duller and 14 c. That’s why the Irish weather is called crazy! It is just unpredictable! 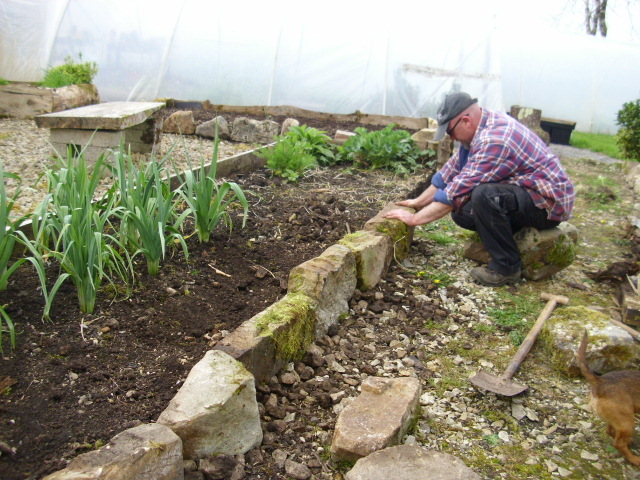 Work continues on edging the beds with stone from the old building in the back field. Coming on very nicely. 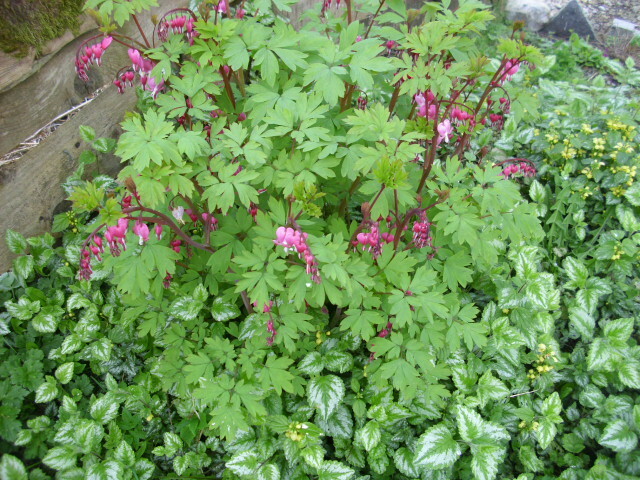 Dicentra spectablis is in flower in the bed nearest the house. This cottage garden favourite has collected many common names along the way. Dutchman’s Breeches, Venus’s Car, Bleeding Heart, Lyre Flower and Lady in the Bath. Lady in the Bath is my fave name for it. She is a rather uncomfartable upside down lady in her bath though! 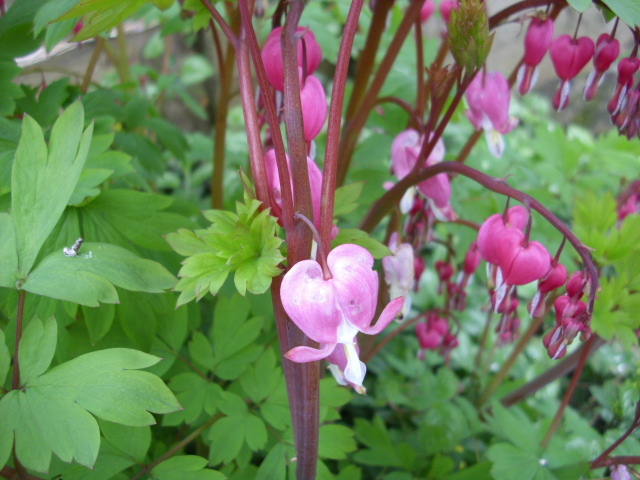 Dicentra likes a sheltered spot and does well in a woodland setting. The only requirement is a mulch each year after flowering. 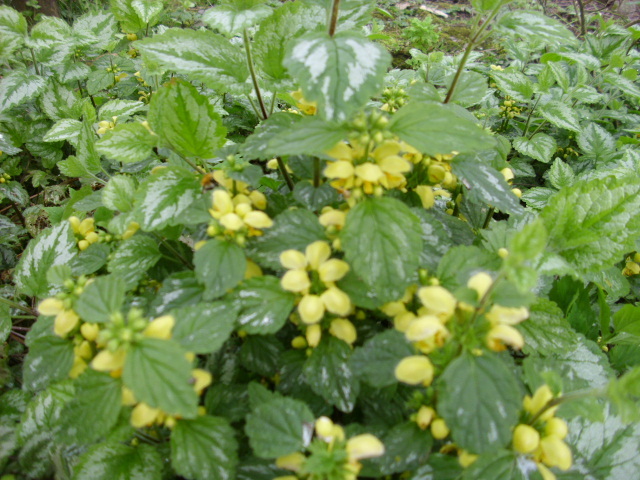 Well drained soil is also needed for this lovely plant to be happy. 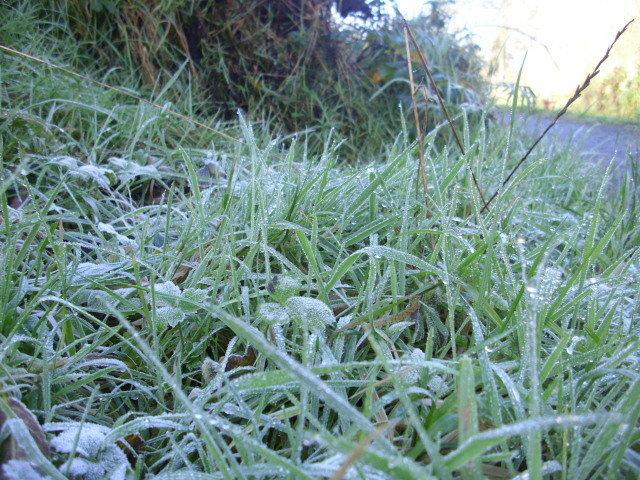 Propogation is by seed or division of clumps in Spring or Autumn. The roots are very brittle. 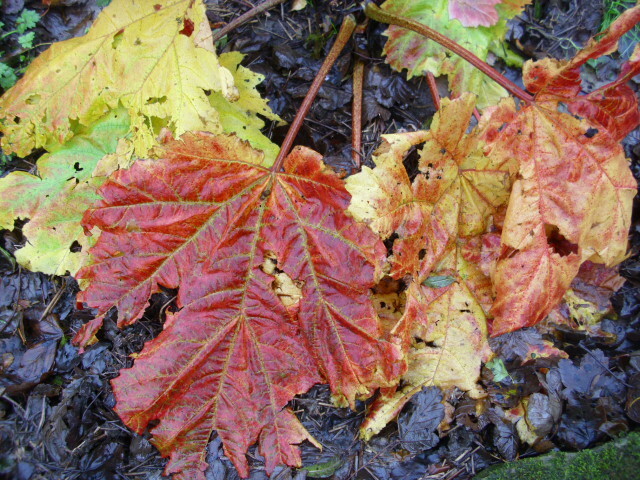 There is also a white flowered variety and a golden leaf one which I’ve only seen in books. 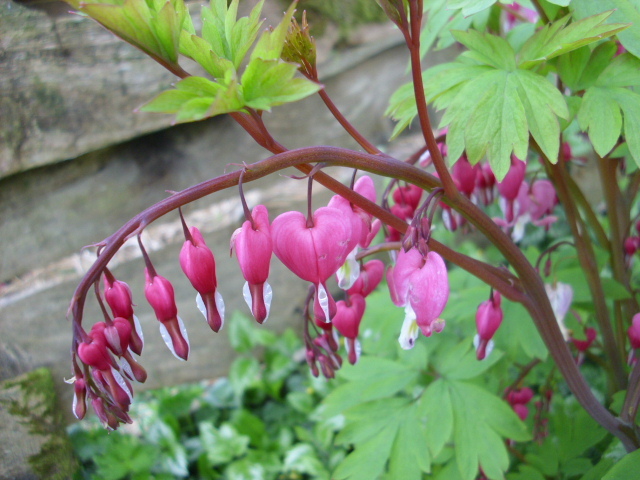 The only caution with Dicentra is that some people’s skin can be irritated by contact with it. I never touch it…just admire fondly from my kitchen window where it resides in the shade of the Birch tree. Lamium or Dead Nettle is also in flower at the moment…somewhat earlier than usual I think. 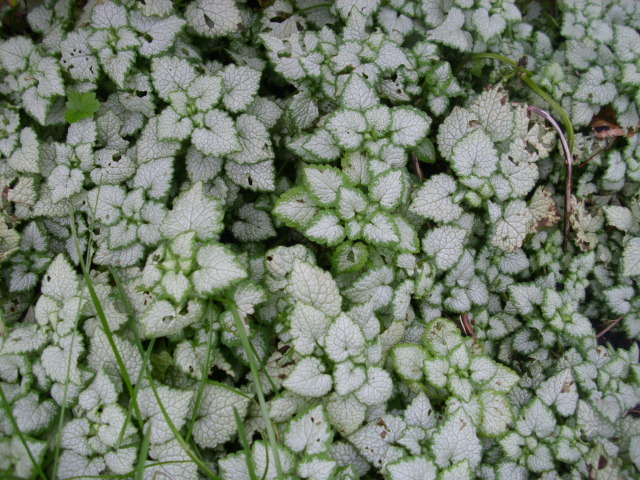 This also grows in the shade of the Birch tree where it is spreading nicely…covering an area where not much else would grow. 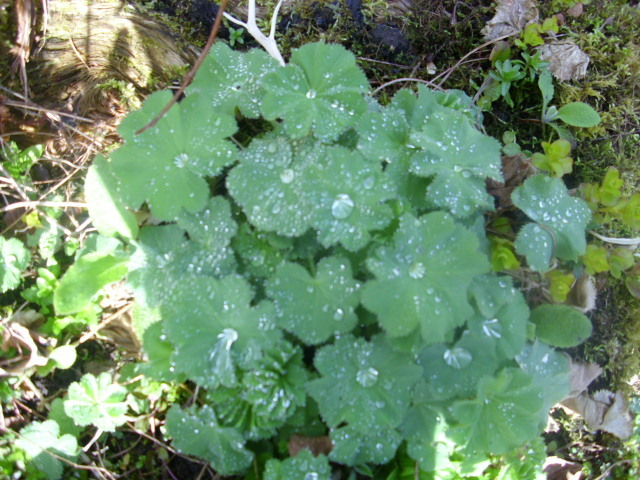 There are about 50 different Lamiums…very useful plants for shaded areas. 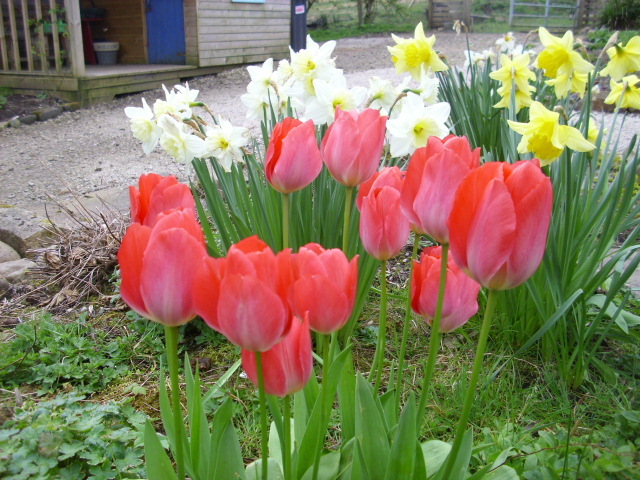 The Spring bulbs are lasting well this year…the weather being a bit kinder than other years. Loosestrife or Lysmachia to give it it’s proper name is emerging very boldly. The colours are very striking now…later they lose the mad pink. This is the variageted variety and like the more common one it spreads like crazy so be careful where you plant it. 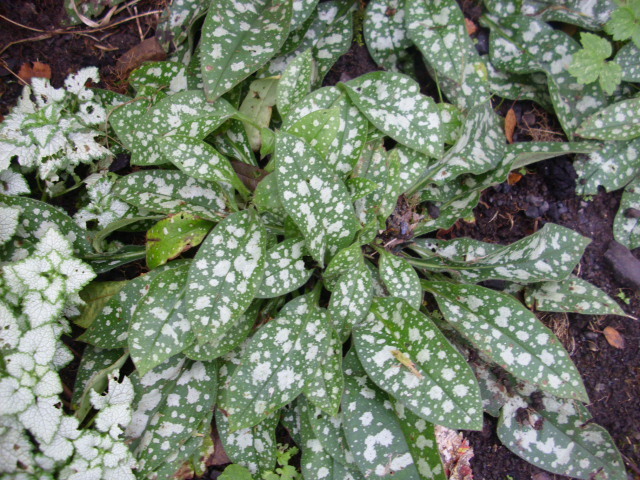 Again it is a plant that does well in shade. 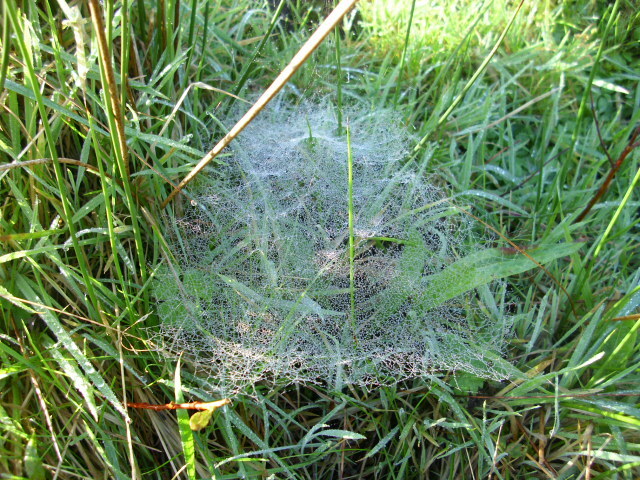 It also likes damp soil. 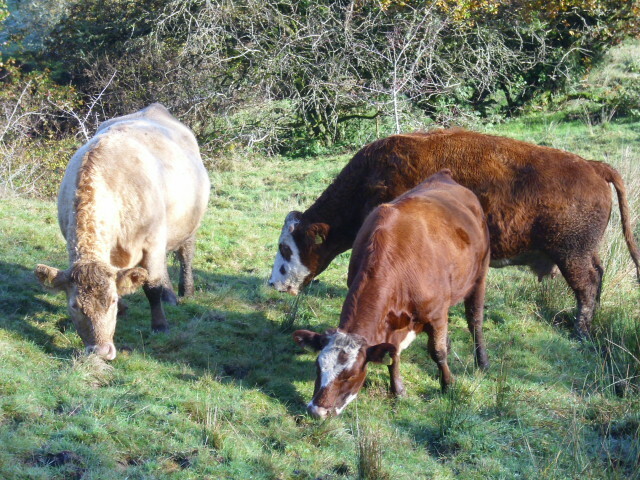 Clumps can be divided every 3 or so years if you want more of it. Some people consider it a bit of a weed but I really like it. Ah well…they say beauty is in the eye of the beholder. In bloom @ Prospect Cottage. The main soundtrack in the garden yesterday was the sound of bees buzzing busily hither and thither. The Plum above is covered in blossom again this year, and the bees are ecstatic. So much has come into blossom in the last week, they are spoilt for choice. 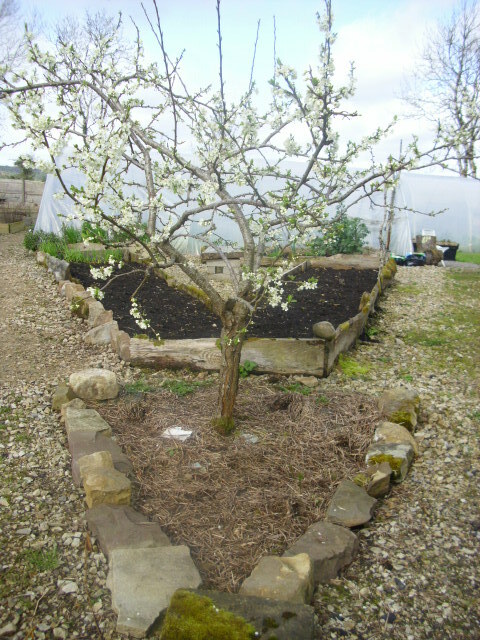 Victoria is the varietyof Plum and it has done well since it started fruiting 5 years ago. Last year we had to prop all the branches they were so laden with plums. I thought it might have a slack year this year but it seems not. The main point to remember with Plums is not to prune in Winter as this can lead to silver leaf which is a fungal disease. 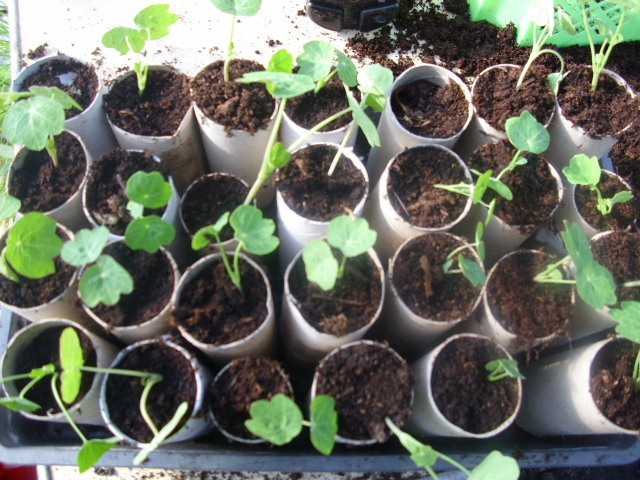 Planted up loads of self-seeded Nasturtiums in the cardboard centres of loo rolls. We save these throughout the year, they make great plant pots, being biodegradable they can go into the earth without disturbing the roots of plants. They are great for peas and beans as they can have a longer root run. 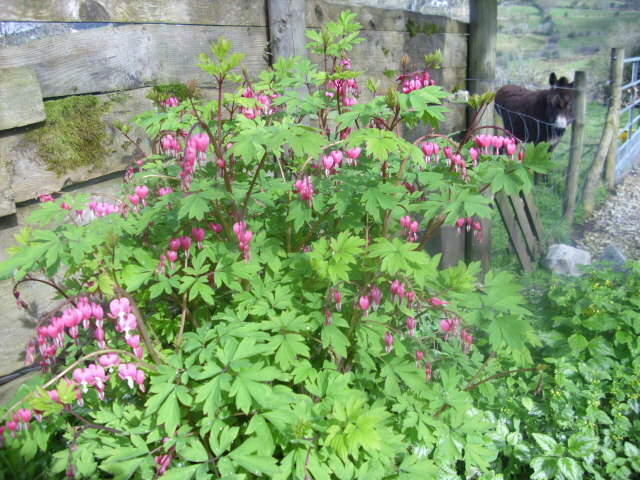 Dicentra spectablis is in full flower now. Very early this year, I’m sure it did’nt flower until May last year. It only seems a few weeks ago I posted pics of it just emerged from the earth. Check out Daphne in the top right hand corner! Lamium or Dead Nettle as it is more often called also seems to be flowering early. 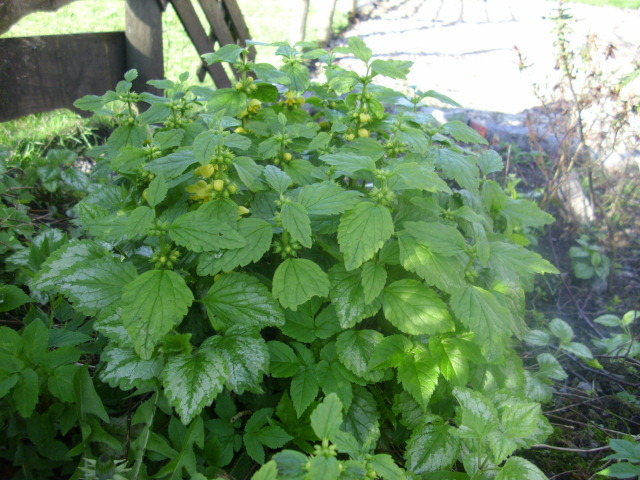 This is a great plant for a shady post and creeps along by throwing out runners, much like strawberries. 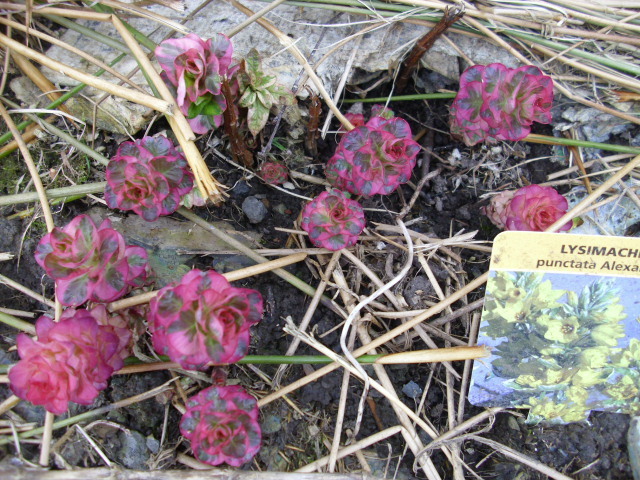 It is easily propogated from cuttings. Dislikes dry soil.